SkinMiles is proud to partner up with the brand Colorescience® an exclusive doctor-recommended mineral sunscreen makeup which is meticulously formulated to include truly protective sun care and deeply nourishing skincare in every product. It is safe to use for the entire family including children and toddlers (6 months and older). Colorescience® sunscreen provides up to 80 minutes protection in the water so ideal for anyone who enjoys the outdoors and water sports. Their moto is to use ingredients with “no compromises now or ever”. Each and every product is thoughtfully formulated with exceptional sun protection and skin-nourishing benefits built in. none of their products contain any mineral oils, alcohol, talc, fillers, dyes, fragrance, or any other harsh chemicals that may be sensitising or damaging to the skin. Here is a simple test that proves the Colorescience® Difference is real. Colorescience high integrity, breathable foundation is on the left and as you can see it rests on top of your skin – lightly and gently. This thin mineral layer is not only locking in moisture, but it’s also preventing the sun’s rays and environmental pollutants from penetrating through. Colorescience works on every skin type, including super sensitive skin types or for those who have had a procedure or facial treatment. On the right, a normal foundation’s impure ingredients come apart and literally, sinks right down into your skin, causing clogged pores, breakouts, itchiness, blemishes, rosacea, and dermatitis. Do the test yourself at home. No scientific beakers required, just a pair of clear glasses. I hope you found the introduction to the Colorescience brand helpful and informative. We can now clearly see the importance of using the best mineral sources to provide us with a waterproof sunscreen that lasts. 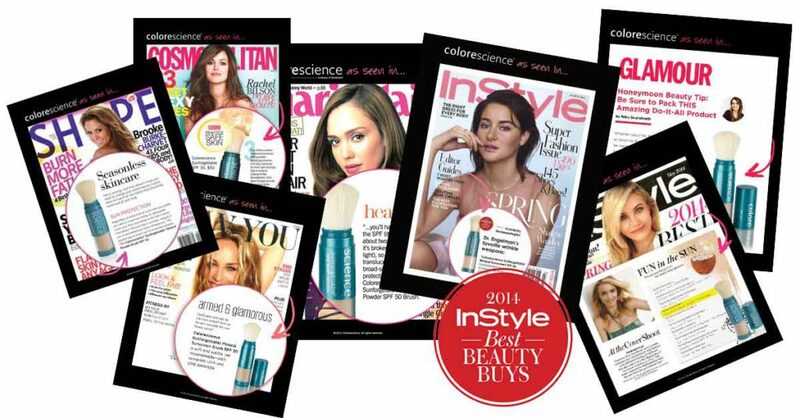 You can purchase Colorescience or watch how to videos on the shop page and product pages.